This is a set of lovely face clipart images to use in your classroom and teacher resource files that you sell and distribute. It includes all clipart in color AND line art. 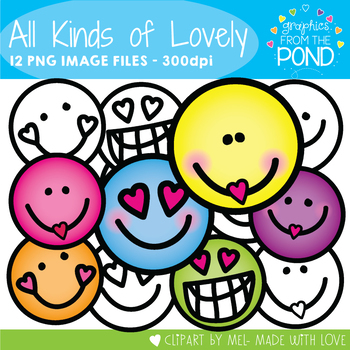 I have included 6 different fun 'lovely' face designs in this set! ♥You cannot use them to make new image files for any reason or clipart to sell or distribute. ♥This license is non-transferable. This means you cannot transfer/ give the license to anyone else, nor can you change the item that it applies to. You cannot give, share, transmit or extend the image files to any other person or company, for any reason.